The leaf season is nearing its peak. Probably another week left for higher elevations. Is the real estate market nearing its peak for the season? September was another great month for real estate sales on the Highlands/Cashiers plateau. The real estate market continues to show good growth. As the leaves near their peak for the season, the real estate market for this area may tend to fall off as well. This is typical and expected every year as people will be leaving the region until next spring. What does this mean for home sellers and buyers? Total homes listed in Highlands/Cashiers MLS: 1399 (decline) Some sellers will take their homes off the market for the winter season so as not to accumulate Days On Market (DOM). However, sales continue year round. Less homes on market is good news for those that remain as there is less competition. Average Sales per Month 1 Year Average: 47 This is a slight increase due to the last 2 months increase in units sold. Inventory: 30 months – This is a slight decrease. 2 factors play into this: (1) Higher number of unit sales, (2)Decrease in inventory. Still, a healthy inventory is considered to be 6 months or less. Average DOM: 365 – Relatively unchanged. Average DOM (YOY): 458 – This is a significant change for the better. Median Sales Price: $380,000 The median has been holding above $300,000 for several months now. This could indicate that many of the REO properties are now clearing the market. Average List/Sell Ratio: 92.14% – This is based upon the “List” price at the time an offer was made. Many homes “Original” list price was much higher, thus the ratio for “Original” list price would be less than above. Synopsis: We’ve had a decent season, but nothing really spectacular. Pricing is everything. If you’re not being shown, pricing is most likely the culprit. Home sales are seeing an increase. This broker has had his best season in 3 years, making many of his clients very happy. You need a broker that will tell you if you’re too high or not, not just telling you what you like to hear. Look at the data to make informed decisions. Ask your broker to show you the data. Land Units Sold: 15- This is about the norm for land sales. 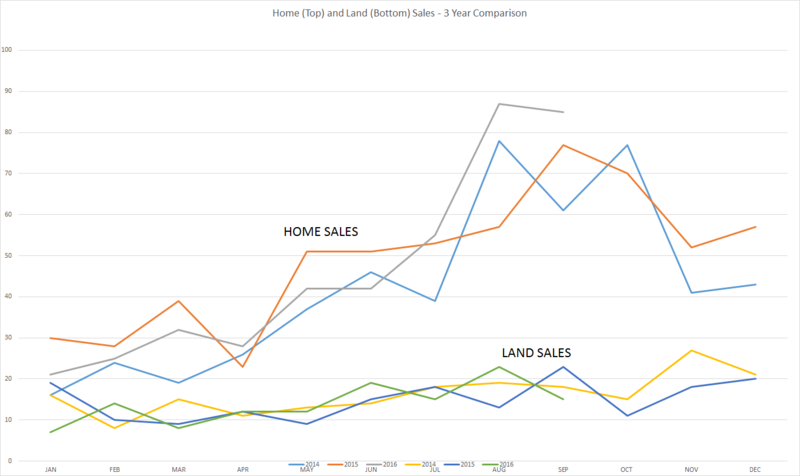 Synopsis: Lots of inventory means lots of land will remain sitting. There are some incredible deals on land out there and even many of these are not selling. 47% of home sales ranged from $200,000 to $499,999. 21% of home sales ranged from $500,000 – $749,999. 7% of home sales ranged from $750,000 – $1,000,000. 16% of sales were above $1,000,000. HOW BIG IS YOUR SLICE OF THE PIE? Sellers, where are you in this chart (click for larger image)? If you understand how narrow your market may be, you may understand how you must be very competitive. Buyers, the Highlands/Cashiers area is seeing some positive signs. There are some great bargains to be found. However, should the market continue to see positive signs, many such deals could be disappearing. DID YOU ENJOY THIS REPORT? Please let me know what other information you would like to see by entering it into the comments section at the bottom of this page. Your input is valuable and I will try to include your suggestions in next months blog. If you’re considering listing your home for sale or purchasing a home in NC, please feel free to contact a local agent or REALTOR®. They will make a specific report for your area of our MLS (Sapphire, Norton, Glenville, Highlands, Toxaway, Clear Creek, Breedlove, Franklin, etc). You can then make an informed decision on how to sell or buy your home.